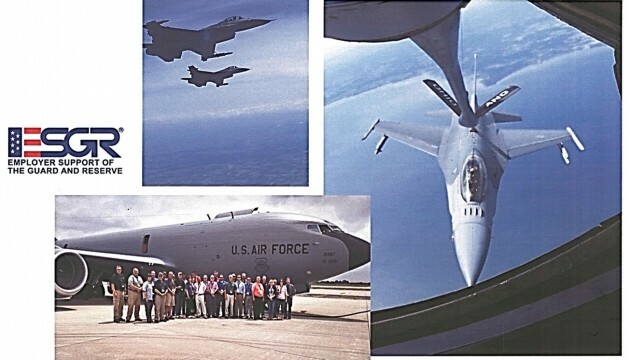 On June 19, 2014, Carl Habekost attended onboard the KC-135R Stratotanker for a Bosslift event hosted by the Employer Support of the Guard and Reserve. Upon arrival at Rickenbacker Air National Guard Base in Columbus, Ohio, Mr. Habekost was briefed on the training mission operated by the 121st Air Refueling Wing. Mr. Habekost and several other employer representatives then boarded a KC-135 Stratotanker to observe “up close and personal” the aerial refueling of several fighter jets. The Employer Support of the Guard and Reserve (ESGR) aims to foster a culture in which all employers support and value the employment and military service of members of the National Guard and Reserve in the United States. Learn more about ESGR Employer programs or the benefits of hiring Guardsmen and Reservists.